Good morning, Albany! Spring is just around the corner, and with it, the rain and mud. Equipping yourself with a vehicle that’s able to combat the rain and mud is important, but it is equally as important to drive a model that suits your lifestyle all year round. The capable lineup of 2017 Chevy trucks in Albany, NY delivers its fair share of performance, durability, versatility, and more. With a large inventory of these spring-ready, summer-qualified trucks here in Albany, New York, there is no excuse for you not to turn your hard earned money into a dependable bowtie brand pickup at DePaula Chevrolet. The main Chevrolet pickup truck lineup is comprised of three different trucks: The Colorado, Silverado, and Silverado HD. Each of these trucks is made up of various special editions, body styles, and performance levels. Let’s take a look at the foundation of each one of these three Chevy trucks, and the basics of what all of them have to offer in terms of variations and limited edition options. Colorado: After making an impressive comeback to the midsize pickup truck market back in 2015, the Colorado is settling into its place in Chevy’s lineup with ease. The 2017 Colorado pickup starts at a budget-friendly price of $20,000, and grabs up to 30 miles per gallon on the highway with its Duramax 2.8-liter turbo-diesel engine. Impressive – right? That’s not the only thing that this truck has going for it. With a maximum horsepower rating of 308, and plenty of capable grit to match, it’s no wonder why the Colorado was named the Truck of the Year by Motor Trend upon its re-entry into this competitive segment. The Colorado is one of the safest trucks on the road, with a standard rear vision camera, and optional forward collision alert and lane departure warning. It also happens to feature the latest in-vehicle technology like Chevy’s 4G LTE Wi-Fi hotspot connectivity, and the brand’s all-new Teen Driver system. The optional diesel powertrain is able to tow up to 7,700 pounds, an impressive number for the small-sized pickup. ZR2: The most capable midsize truck on the market is arguably the 2017 Colorado ZR2. When equipped with the 3.6-liter V6 engine, this pickup packs serious best-in-class horsepower, a segment-first Multimatic Shocks system, and front and rear electronic locking differentials. If you opt for the exclusive Duramax 2.8-liter turbo-diesel engine for the ZR2, you get best-in-class torque. It’s the pickup that was built to go from comfortable city driving, to muddy off-road excursions with ease and grace. The off-road suspension and tubular rock protection make it the perfect off-road machine, while skid plates, and an Autotrac transfer case add to its intense capability. The Colorado ZR2 doesn’t just stand apart from the base models under the hood, it boasts an entirely different exterior design, interior refinement, and a rugged, wider stance that other midsize pickups simply miss. Silverado 1500: When we say that the 2017 Chevy Silverado is the most dependable, longest-lasting pickup truck on the road, we aren’t blowing smoke. Ranked highest in its class for initial quality by J.D. Power, and starting at an MSRP of only $27,785, the Silverado 1500 is truly a force to be reckoned with. The muscular exterior appearance gives the Silverado an undeniable level of clout, which other pickups in its class sorely miss. With numerous trim level options to choose from, the Silverado 1500 can be the exact truck you need it to be, and deliver the exact amount of power your lifestyle demands. The 6.2-liter EcoTec3 engine delivers a heart-pounding 420 horsepower rating, and a near-perfect matching torque of 460 lb.-ft. Those numbers don’t just make the 2017 Silverado 1500 a powerful truck, they make it the most powerful pickup in its class with a tow rating of up to 12,500 pounds. The standard 4.3-liter EcoTec3 powertrain can still manage to pull up to 7,600 pounds, thanks to its very capable 285 horsepower rating. High Country: The 2017 Silverado 1500 High Country model is the perfect example of why trucks shouldn’t be counted out when it comes to luxury. This pickup is more luxurious than most sedans, featuring rich leather upholstery, a wireless charging station, real woodgrain trim, and chrome accents throughout the comfortable and spacious cabin. Simply put – this is the pickup truck for someone who wants just as much luxury, as power and performance. Realtree: This is the outdoor enthusiast’s dream come true – in the form of a capable pickup truck, of course. The Silverado Realtree special edition was designed by outdoor enthusiasts as the ultimate truck for everything involving Mother Nature. This pickup boasts Realtree exterior camouflage graphics, black appointed leather interior, Rancho shocks for all-terrain adventure, and blacked-out Chevy bowtie emblems. If you want be to one with nature, then this is the truck to do it in. Silverado HD: The 2017 Silverado HD lineup is the most capable and heavy-duty pickup truck offering in Chevrolet’s lineup. The 2500HD is capable of towing up to 18,100 pounds, while the 3500HD model can extend that number even further to 23,300 pounds. Both trucks are leaders in their classes, and start at just $33,610 and $34,710, respectively. Let’s take a closer look at each one, and see if one might be a better option for your needs over the other. 2500HD: Rated as the most dependable, longest-lasting full-size pickup truck on the road, the Silverado 2500HD is a heavy duty truck in every way imaginable. Available with the traditional Vortec 6.0-liter V8 gasoline powertrain, as well as with a Duramax 6.6-liter Turbo-Diesel engine, this pickup can grab up to 910 lb.-ft. of responsive and impressive torque. The hood-mounted vents aren’t just powerful in appearance, they are powerfully functional as well. 3500HD: This is the most capable and powerful pickup truck available from Chevrolet in 2017. With a relatively low starting MSRP, this pickup truck offers a max payload capacity of 7,153 pounds and manages 910 lb.-ft. of torque. When equipped with the same Duramax turbo-diesel V8 as the 2500HD model, the 3500HD is capable of producing up to 445 horsepower, and tow 23,300 pounds. Not bad, eh? Each of these capable pickup trucks are offered in a variety of different trim levels, as well as in various special editions. 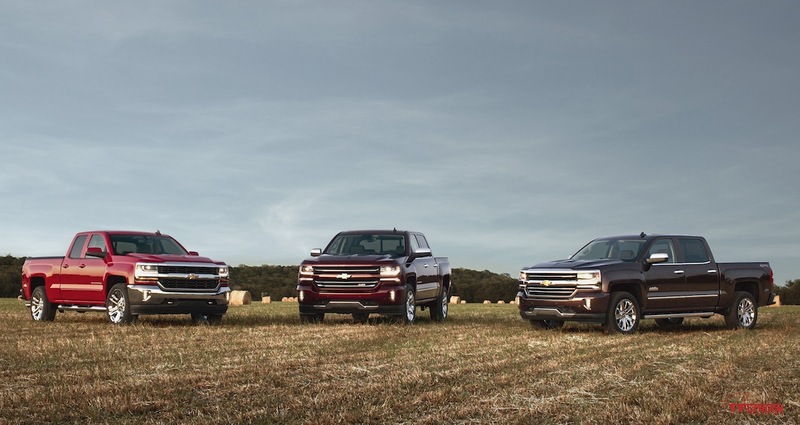 The Chevrolet pickup truck lineup is unlike any other on the market, and promises to keep you on track for your hard work, just as much as it will for play. Be sure to come down to DePaula Chevrolet here in Albany, New York, and experience these incredible workhorse pickups for yourself. Whether you are a current Chevy truck owner, or want to explore what the brand has in store for the 2017 model year, the expert team at DePaula Chevrolet is ready to help. Simply bring in your list of needs, wants, and must-haves, and our expert team will find you the perfect Chevrolet pickup that ticks off all the boxes on your checklist. If you aren’t able to drive down today, don’t worry! Our entire inventory is available on our comprehensive website, and is updated multiple times per day. We also went ahead and put together a list of every new Chevy pickup in the 2017 lineup, so that you can get a better idea of which pickup truck will best suit your unique set of needs. Take a look at everything this dependable truck lineup has in store for the new year, and find out which one is right for you.